If you came by, then thanks heaps! 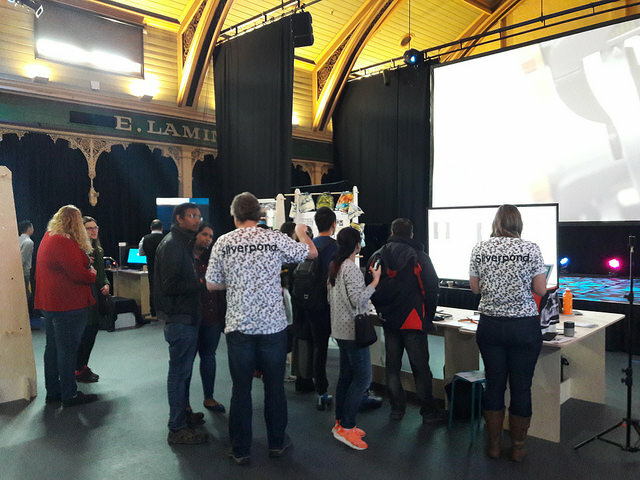 It was a really great feeling to be chatting to everyone about something we’ve worked hard on, mostly in our spare ttime, over the last few months. 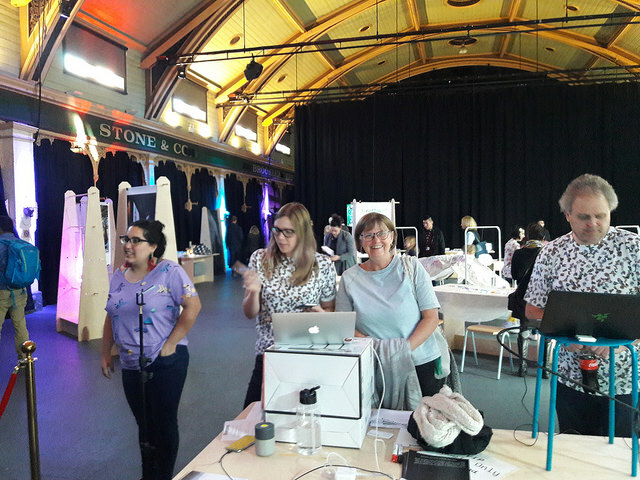 It was also fantastic to be amongst all the cool people from RMIT (thanks Kiri and Jessica! ), who are working on lots of very interesting fashion projects. Hoping to collaborate on something with them soon! We posted a few photos on our instagram, @silverpond_ml, from the day. I wanted to take some time now to break down how the pieces fit together, and also provide a little bit of a summary of what people found on the day. It’s entirely browser-based (including all of the deep learning) so it actually works best when you view it on a computer with a GPU. I think it is also only supported on Google Chrome/Chromium at the moment, and it will take ~1 minute to load the first time. “B”: Change the brush to black. Hover over the icons with the mouse for more information. On the right side of this little section is the main “designed” image. In the middle you are able to control what “print” is placed on this item. Here I’ve drawn an indicative blue line that, when wrapped around in the circle (in an anti-clockwise way) gives the signature diagram! Parameters: In this region you can have direct control over the parameters that influence the image that is shown. In particular, there are 8 parameters here, and each of them can be controlled via the slider. The images next to each slider show what the image would be if that particular parameter was set to the value at that region of the slider. You can control these by dragging, or if you’re on a fast enough computer, you can just hold down the numbers 1-8 to move them up, and Shift 1-8 to move them down. Perhaps of mild interest to people is the suite of technologies that were involved in putting this together. Deploy it to GitHub Pages. The training time for the fashion-space model took only about 30 minutes on a single GTX 1080 TI. It turns out that there are quite a few deep learning models/techniques in play here. I learned a lot from, and was heavily inspired by, hardmaru and his cppn-gan-vae-tensorflow project. A CPPN so that we can generate arbitraryly-large images that are smooth and not pixelated. 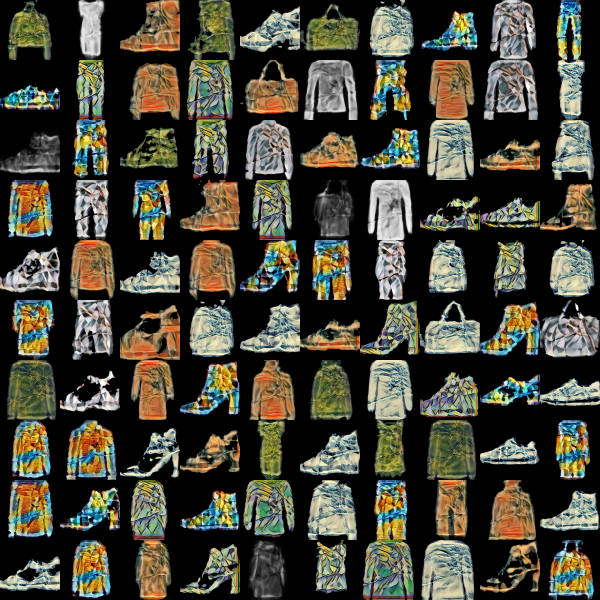 A style-transfer network (infact, fast style transfer) to apply the prints to the images. The gan-vae-cppn is munged together as one model, where we build an autoencoding network with a latent vector of size 8 (the number of parameters we allow the user to control!). We found that this approach made it much easier for people to interact with the interface. 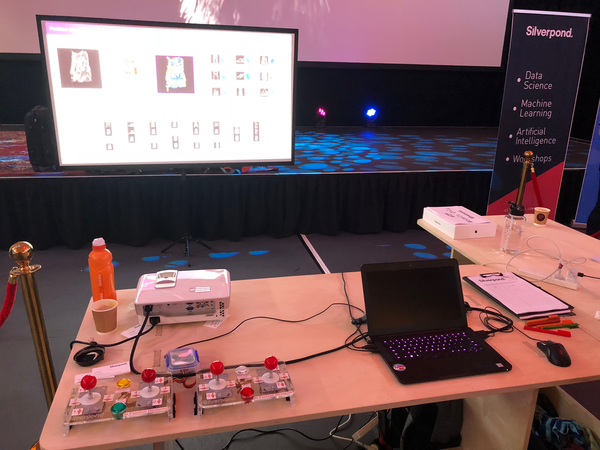 Without it, the interaction has reasonably complicated, it either required knowledge of gaming controls (which a lot of adults don’t have) or an overly-complicated custom control system, which no-one but me was familiar with. But what I really wanted was to see how well the people explored the entire space of available designs. So I figured it was a good time to try UMAP. 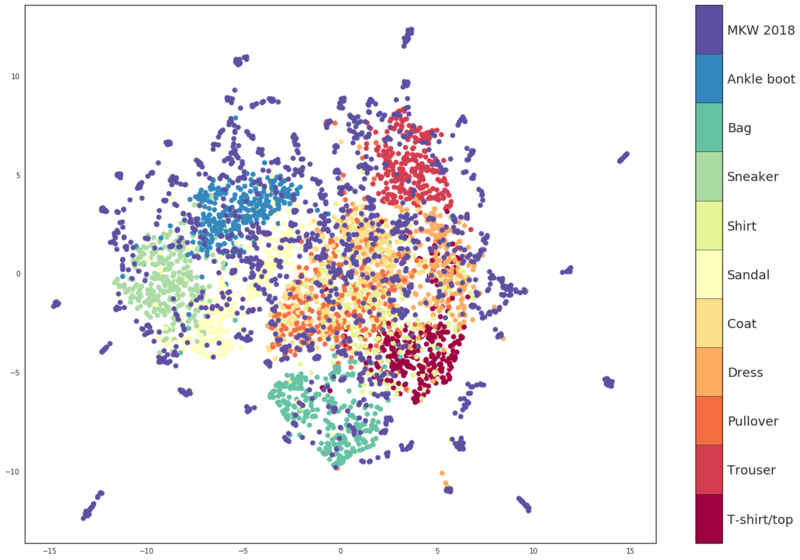 UMAP is a recently new dimensionality reduction approach; similar in nature tot-SNE and PCA. 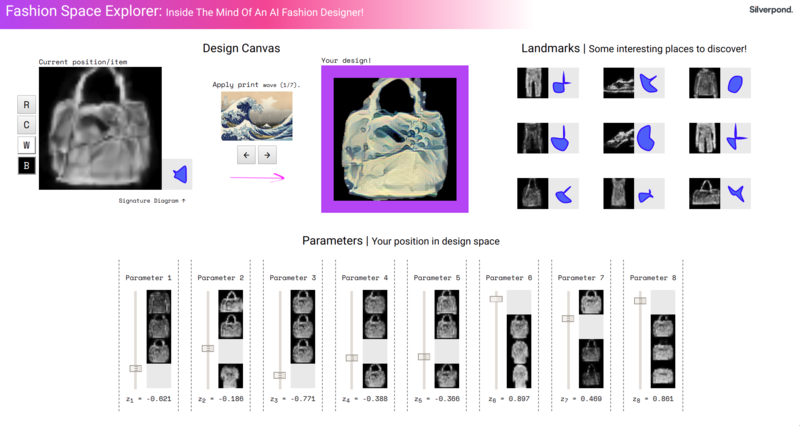 What I wanted to do was get a 2d view of my fashion space. Now, this is super-cool! One reason it’s very cool is that the network I trained had no direct incentive to think about classes. It wasn’t trained on the type of item it was looking at at all; it was just trained to be good at reconstruction (as well as the VAE part, which encourages it to be well-distributed). 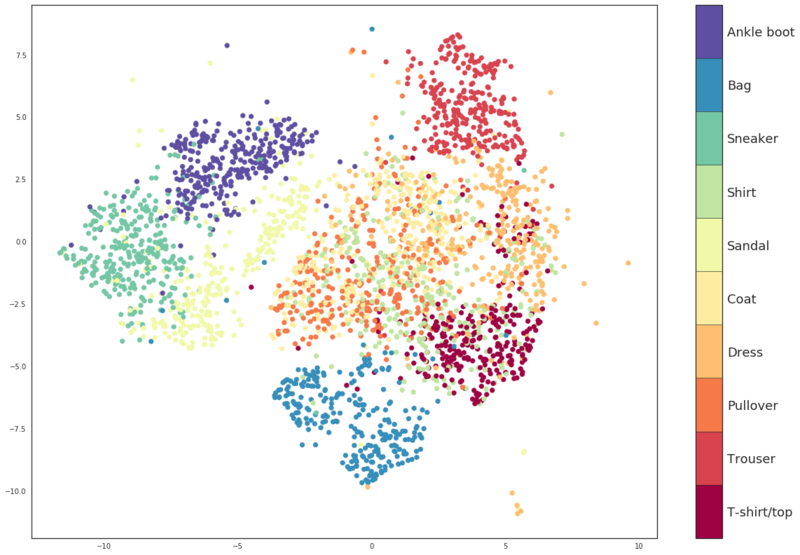 But even still, this model has learned some pretty good ability to perform classification. For example, it would very rarely confuse a bag with anything else, and it would be quite good at distinguishing boots, sneakers, and sandals. There’s a fair amount of overlap between shirt, coat, and pull-over, and this is clear in the kind of images that come out of the tool itself. Cool! We can see that the MKW points (the purple ones) hit at least every class. We can also see, quite interestingly, that we hit many points wildly outside the training set. In part this is probably due to the “hyperspace jump” button, that took people to a random point (here the z-vector was drawn uniformly at random from the range -1 to 1 in each dimension). 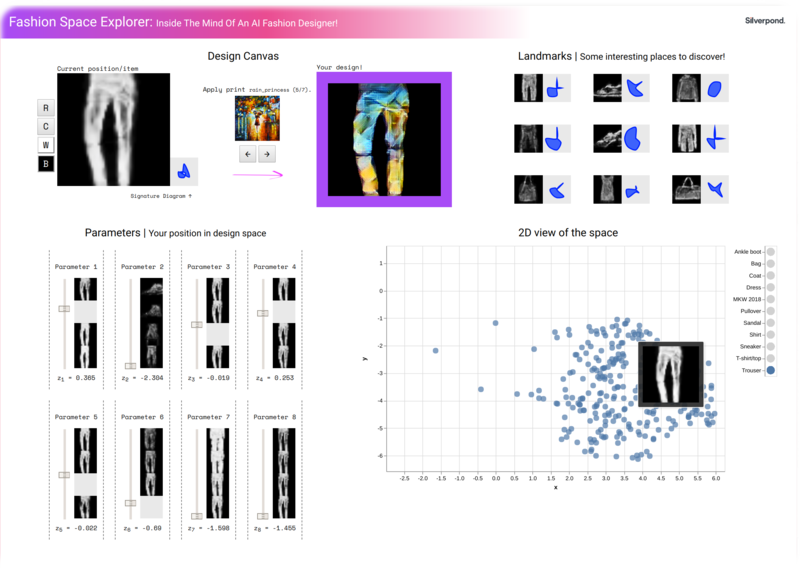 It’s cool because now you can mouse-over points and see the reconstructed image for that dataset, and you can click on the points and load them up in the fashion space explorer! 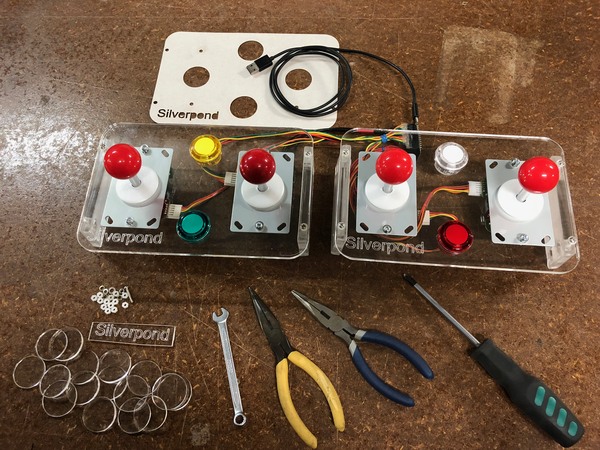 I want to thank everyone at Silverpond who put in heaps of hard work and moral support for this project, but specifically highlight Susie and AndyG for doing a great deal to make this possible and engaging for people. Finally, if you’re inspired by this or in any way interested, please do get in contact with me: noon.silk@silverpond.com.au.